MOSCOW, September 25. /TASS/. Ukrainian naval ships Donbass and Karets passed through the Kerch Strait, which links the Black Sea and the Sea of Azov, with due permission from Russian control agencies that is required under law, the press service of Russia’s Federal Agency for Maritime and River Transport [Rosmorrechflot] told TASS on Monday. "[Under provisions of the law] a ship’s captain issues a request to a maritime administration, or to the sea traffic department reporting to the federal service of seaports [Rosmorport], asking them to permit passage through the Kerch-Yenikale Canal, which is the navigable waterway in the Kerch-Yenikale Strait," a spokesman for the press service said. "The sea traffic department declares the requirements to the captain, like proceeding through strait in a convoy of ships, and Ukrainian ships were included in the convoy, too," he said. "Rosmorport sent a navigation pilot to the Korets sea tow that was sailing first, and he remained at the ship’s bridge and steered it down the canal." The spokesman said the captains of Ukrainian ships requested all the permissions for passage through the Kerch Strait required by Russian and international legislation. The command ship Donbass and the sea tow Korets left the main base of the Ukrainian Navy in Odessa on September 20 and passed through Russia’s exclusive economic zone around Crimea on September 20. They were escorted on the way by ships of the coastal guard of Russia’s Border Guard Service. On Sunday, they passed under the Crimea Bridge linking the Crimean Peninsula and mainland Russia and entered the Kerch Strait and the Sea of Azov. The Ukrainian military portal said on Monday they were heading for Mariupol, a port city in the part of the Donetsk region controlled by the Kiev government. The Ukrainian authorities harbor the plans to use the Donbas and the Korets to reinforce the infrastructure of a new naval base they are creating in the coastal city, formerly a popular seaside resort. According to Ukrainian media reports, the Donbass has a capacity for housing the command staff of the future base and for accommodating the sailors. It also has warehouses and other necessary service rooms that are not available in Berdyansk at the moment. The Ukrainian Armed Forces are also mulling a reinforcement of the ground troops in the Sea of Azov area. At this moment, two gunboats of the Gyurza-M class are already in the Sea of Azov and the military commanders also plan relocation of Kentavr assault boats there. 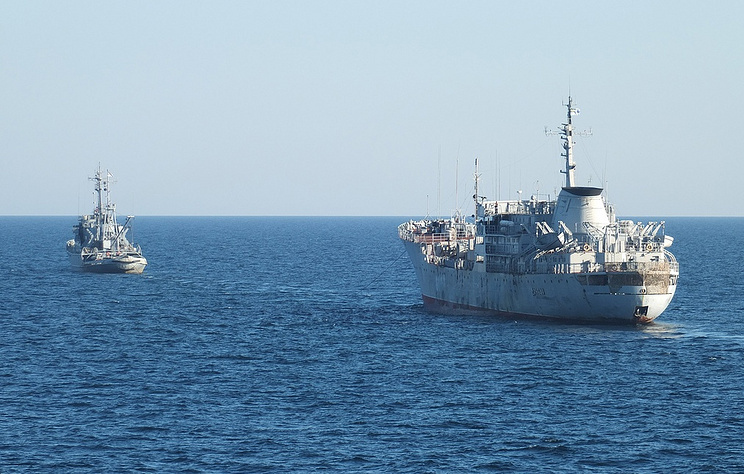 The problem of utilization of the Sea of Azov water spaces aggravated after the Ukrainian border service after an incident on May 25 when the Ukrainian border guards detain the Russian fishery ship Nord. The authorities are still keeping the crew in Ukraine. The Russian border guards stepped up the inspections of Russian fishery ships after that while Kiev said it was important to set up a grouping of ships and gunboats in the Sea of Azov, the goal of which "to counteract to Russian border guards." Ukrainian Foreign Minister Pavel Klimkin mentioned the plans to denounce the Ukrainian-Russian agreement on cooperation in the use of the Sea of Azov and the Kerch Strait, which the two countries signed in December 2003. The document gives the sea the status of internal waters of the two countries. The status of internal waters enabled both countries to exercise full control over the situation there on the basis of parity. Now Kiev plans to delineate a state border there.